These muscles are innervated by the suboccipital nerve. 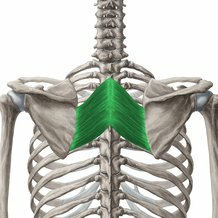 The rhomboid major and rhomboid minor muscles are muscles adduct and elevate the scapula. 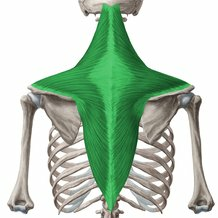 Rhomboid major has its origin on the spinous processes of the T1 to T4 vertebrae and inserts on the medial border of the scapula. 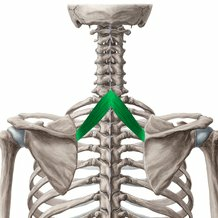 Rhomboid minor has its origin on the spinous process of the C6 to T7 vertebrae and also inserts on the medial border of the scapula above the spine of the scapula. Both muscles are innervated by the dorsal scapular nerve (C4 to C5), which is a branch of the brachial plexus. 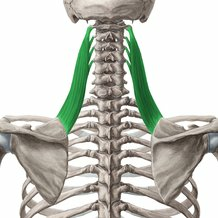 The lavator scapulae muscle has its origin on the transverse processes of the atlas and axis and the tubercles of the C3 to C4 vertebrae and inserts at the superior angle and medial border of the scapula. It is also innervated by the dorsal scapular nerve. 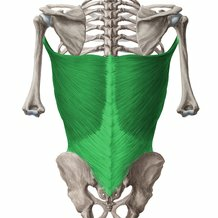 The serratus posterior superior muscle has its origin on the spinous process of the C6 to T2 vertebrae, inserting on the 2nd to 5th ribs, while the serratus posterior inferior muscle has its origin on the thoracolumbar fascia, the lower thoracic vertebra and the upper lumbar vertebra, inserting on the 9th to 12th ribs. Both muscles are innervated by the posterior branches of the spinal nerves. 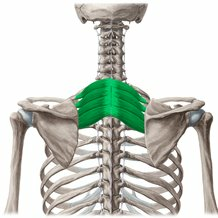 The trapezius muscle is innervated by the accessory nerve (CN XI) and the cervical plexus (C2 to C4), has its origins on the occipital bone and the spinous processes of the T1 to T12 verterbae, and inserts on the lateral third of the clavicle, the acromion and the spine of the scapula. 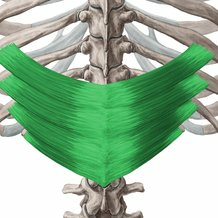 The latissimus dorsi muscle is innervated by the thoracodorsal nerve (C6 to C8) which is a branch of the brachial plexus. It has its origins on the T7 to T12 vertebrae, the iliac crest, the 9th to 12th ribs and inferior angle of the scapula, and inserts on the lesser tubercle of the humerus.